David Foster Wallace killed himself on my birthday earlier this month. 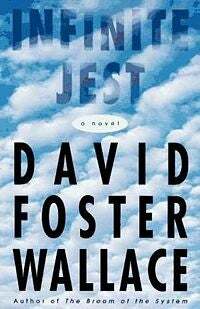 Out of curiosity I decided (not for the first time) to start reading his novel Infinite Jest. After I complete it, it will be the longest book I have ever read. Reading this detailed and excessively footnoted book that creates an entire universe of details reminds me of how difficult it is to hold a reader's attention for that long. It's rare that a novel of this length doesn't stray into SF territory: with a lot of pages to fill...why not make something up, the more outlandish the better? Then I started wondering: What are the longest books in science fiction, and what do they promise for the insane person who tries to read them?We've already covered books that span millions of years, and an e-novel, Marienbad My Love, that set a length record this summer, but what about the one-volume giants of the print world? The Book: Robert Burton's 1861 catalog of his humanity, The Anatomy of Melancholy. How long? : 1,392 pages Should I try to read it? : The Anatomy of Melancholy, here seen in its most recent addition by the New York Review of Books press, was the template for much experimentation in early speculative fiction. Burton's analysis of his own mind and body was revolutionary in itself, connecting science directly with fiction. Still, it may not be the smoothest read: Burton's long sentences go on and on; it might well be best to use Melancholy purely as a reference tool when you're feeling down. The Book: The actual title is The Story of the Vivian Girls, in What is known as the Realms of the Unreal, of the Glandeco-Angelinnian War Storm, Caused by the Child Slave Rebellion by Henry Darger, but it's commonly referred to as In the Realms of the Unreal. How long? : 15,145 pages Should I try to read it? : Its author, Henry Darger, spent most of his life as a janitor in Illinois, attending Mass several times every day. Probably the most astonishing thing about the manuscript is that it was accompanied by several hundred pages of illustrations as well as a 5,000 page autobiography, and 10,000 pages of a sequel to The Realms of the Unreal. Few have attempted to read The Realms of the Unreal, but it is reportedly a Christian science fiction/fantasy epic. You can't exactly go out and buy this one in stores, but it's good to know it's out there. For the curious, Jessica Yu made a documentary about Darger in 2005. The Book: Ayn Rand's Objectivist slugfest Atlas Shrugged How long? : approximately 645,000 words and well over 1000 pages, depending on the edition Should I try to read it? : Whittaker Chambers didn't like it much, but Rand's last attempt at fiction is one of the biggest sellers ever, and the SF elements of its weird alternate present distinguish it from its more realistic predecessor, The Fountainhead. Somehow the book contains a thirty page speech in it by hero John Galt. One of Justice Clarence Thomas' favorite novels, Atlas Shrugged might be better skimmed than actually read cover to cover. The Book: The Stand How long, exactly? The 1990 uncut edition totaled 1141 pages. Should I try to read it? : Stephen King's The Stand brought the long long-form to many mainstream readers who might not normally embark on such a quest. Like most of King's work, he capably draws together many disparate elements, including a biological super-weapon and a post-apocalyptic world. The Stand might even be due for a comeback: King himself updated the dates in the book when he brought it out again in 1990. At our economy slowly crumbles, we might not have to make an adaption starring Steven Weber — we can live it for real. The Book: Peter K. Hamilton space opera The Naked God How long? : For an author whose short novels comprise nearly 500 pages, The Naked God packs a extra-special punch. At 1,174 pages, the last book in Peter K. Hamilton's operatic Night's Dawn trilogy is part of a larger whole, sized at 1.2 million words, begging the question of how he can expect any other writer to get up in the morning. Should I try to read it? : This is a series that is such a whale it has its own plankton in the form of a helpful guidebook. Unlike some of the other authors here, Hamilton's book is meant to be read - it's not just a space oddity. Clear, polished prose helps, and the themes of this late 90s trilogy remain eerily prescient. What's the longest book you've ever read, SF or not?